This guide describes how to enable SSL for NiFi and configure Kylo to communicate with NiFi over SSL. As part of enabling SSL, NiFi will also automatically enable authentication requiring all users to provide a client certificate to access the NiFi UI unless an additional authentication method is configured. Information on additional authentication methods can be found in the NiFi System Administrator’s Guide under User Authentication. Please see Enabling SSL for NiFi for additional instructions on enabling SSL for NiFi. To enable SSL for Kylo and configure NiFi to communicate with Kylo over SSL, please see the Kylo UI and SSL guide. Client certificates are used to authenticate the default admin user (aka Initial Admin Identity) and other NiFi nodes. 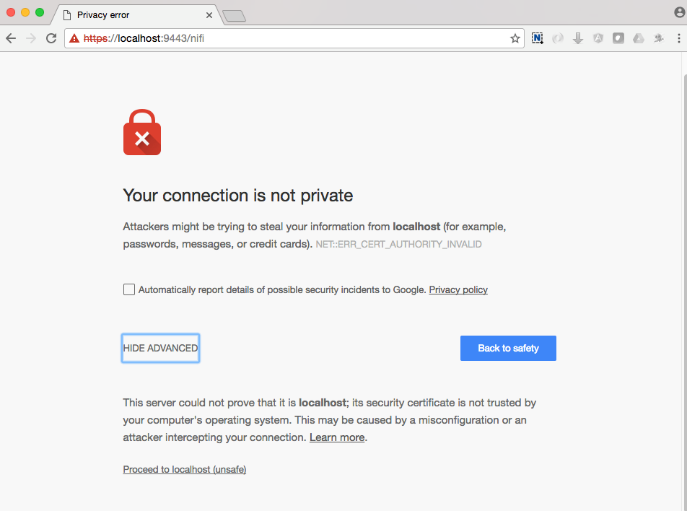 It can either be a self-signed certificate or one signed by a CA (certificate authority). A self-signed certificate is the most common option and is the easiest to install, but a certificate signed by a CA provides an additional chain of trust for those that need it. Kylo should be configured to use this client certificate to communicate with NiFi. It is recommended to start with a self-signed certificate and verify that everything works. It can then be replaced with a certificate signed by a CA. NiFi provides a toolkit for generating a self-signed CA and the certificates necessary for SSL communication and authentication. However, web browsers will display an “untrusted certificate” error when accessing the NiFi UI and will only allow access after acknowledging the risk. Adding the CA to the web browser’s trust store will prevent the error from being displayed. /opt/nifi/nifi-toolkit-1.6.0/bin/tls-toolkit.sh standalone -n '<hostname>' -C 'CN=kylo, OU=NIFI' -o . An SSL certificate signed by a CA (certificate authority) will ensure that all web browsers display NiFi as a trusted site. This section assumes that you’ve already completed Option: Self-Signed. Generate a CSR (certificate signing request) with the CN (common name) set to the hostname that will be used to access the NiFi UI. Send the CSR to the CA and have it signed. A client certificate signed by a CA (certificate authority) provides an additional chain of trust for Kylo to communicate with NiFi. This section assumes that you’ve already completed Option: CA Signed SSL. 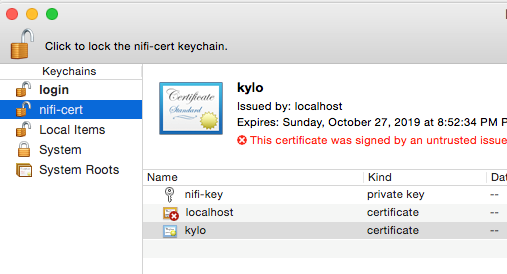 Generate a CSR (certificate signing request) with the subject set to /OU=NIFI/CN=kylo and the DNS hostname set to the hostname that will be used by Kylo to access NiFi. Send the CSR to the CA and have it signed. Kylo and NiFi will need to be configured to use the certificates created in the previous section. The Initial Admin Identity must exactly match the subject of the client certificate as displayed by keytool. NiFi will automatically add a matching user to /opt/nifi/current/conf/users.xml. If the client certificate is updated with a different CN, then users.xml will also need to be updated. <!-- Provide the identity (typically a DN) of each node when clustered, see above description of Node Identity. Restart NiFi if any files were changed. Web browsers can also be configured to use the client certificate to access NiFi. 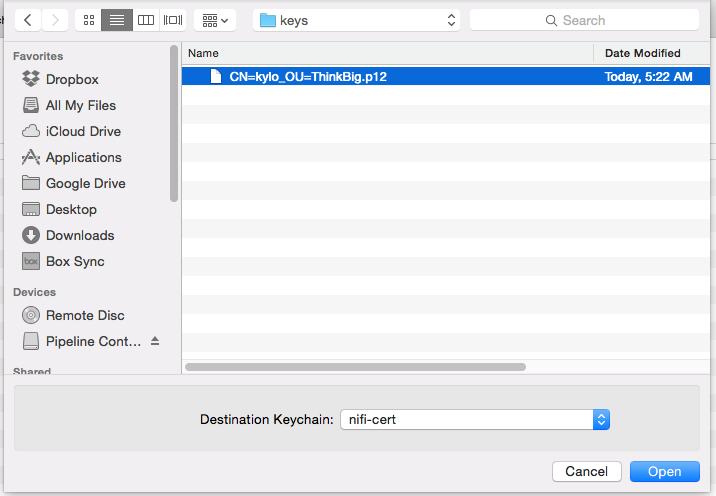 Copy the .p12 file that you created above (nifi.rest.keystorePath) to your Mac. Create a new keychain with a name. 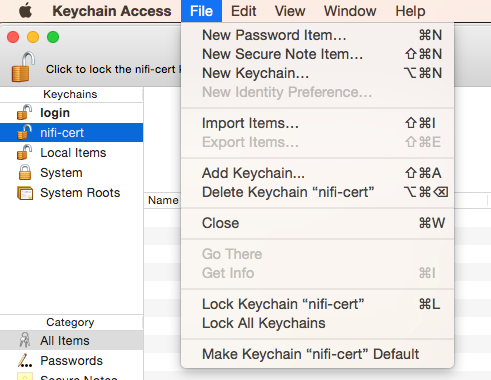 The client cert is copied into this new keychain, which in the example here is named “nifi-cert”. If you add it directly to the System, the browser will ask you for the login/pass every time NiFi does a request. 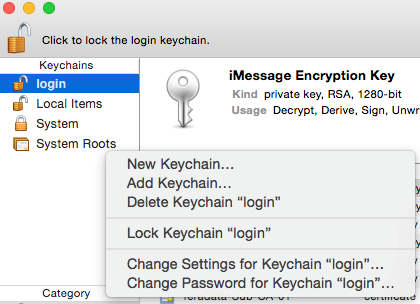 In the left pane, right-click “Keychains” and select “New Keychain”. Give it the name “nifi-cert” and a password. Once the keychain is created, click on it and select File -> import Items, and then find the .p12 file that you copied over in step 1. Open the port defined in the NiFi.properties above: 9443. 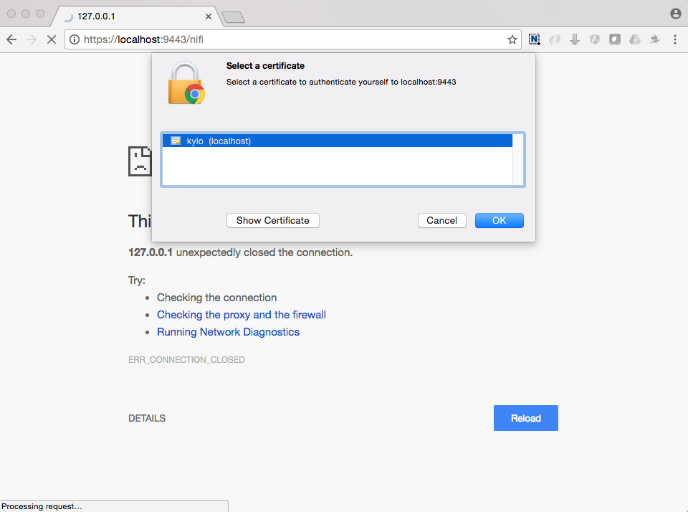 The first time you connect to NiFi (https://localhost:9443/nifi) you will be instructed to verify the certificate. This will only happen once. Click OK at the dialog prompt. Enter the Password that you supplied for the keychain. 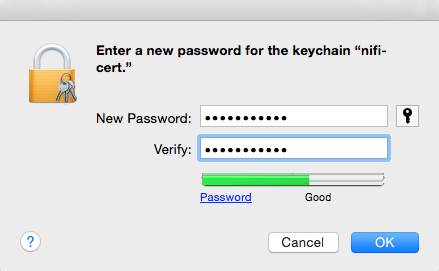 This is the password that you created for the keychain in “Importing the Client Cert on the Mac” Step 3b. Click AdvancKyloConfiguration.rsted and then Click Proceed. It will show up as “not private” because it is a self-signed cert. NiFi under SSL. Notice the User name matches the one supplied via the certificate that we created: “CN=kylo, OU=NIFI”.